Individuals within groups benefit when they are phenotypically and behaviourally similar. Despite this, mixed-species aggregations are found among a wide range of animal taxa and are known to provide advantages in terms of enhanced foraging efficiency and predator avoidance. However, little is known about individual level interactions within these groups or the mechanisms mediating their structure. Diet-derived chemical cues can mediate within-species associations in fish, but it is not known whether they serve a similar function across species. To investigate this, we created mixed-species groups of sympatric three-spined (Gasterosteus aculeatus) and nine-spined (Pungitius pungitius) sticklebacks and manipulated the diet of the constituent group members. We found that three-spined sticklebacks did not associate more frequently with conspecifics over heterospecifics when all animals received the same diet, suggesting that species-specific cues did not influence association patterns. However, when group members were fed different diets, they interacted with heterospecifics fed on the same diet more than with conspecifics from a different diet treatment. This study demonstrates the importance of chemical cues as a possible mechanism for establishing familiarity, and thereby mediating within-group structure even between individuals in mixed-species aggregations. Understanding these underlying mechanisms has significant implications for our understanding of other social dynamics, including social learning and information transfer. Mixed-species groupings are common among animals, although we have a poor understanding of how these groups are structured, what mediates interactions between group members, and what the function of such groups is. In a study using two co-occurring stickleback species, we show that fish preferred to associate with shoal members fed the same diet as themselves, irrespective of their species. This is most likely mediated by diet-derived chemical cues and may allow fish to avoid detection by predators or forage alongside individuals with similar dietary preferences. 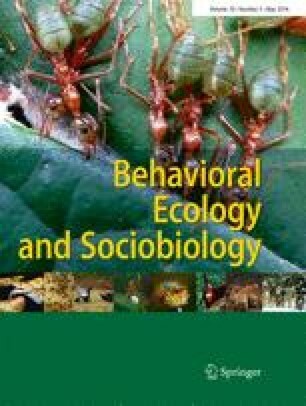 Understanding the mechanisms underpinning non-random associations in mixed-species groups has significant implications for our understanding of other social dynamics, including social learning and information transfer. We thank W. Hayes for the support in analysing the water samples, D. Simpson for animal husbandry and P. Sriphavatsarakom for providing the photographs. We also thank two anonymous reviewers for their constructive comments which improved the manuscript. All methods used in this study adhered to the ASAB Guidelines for the Use of Animals in Research and gained local institutional ethical approval (UoL 13/45).